With Valentine’s Day around the corner, create a romantic addition to your home for the sweet day that celebrates love and happiness. Create texture on solid fabrics with a variety of decorative stitches, using cotton thread for a soft sheen. 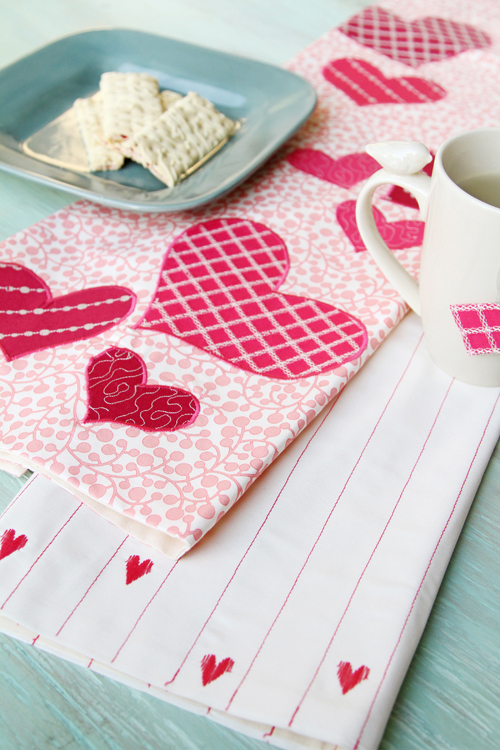 This cute set of kitchen towels is filled with appliquéd hearts stitched in a modern style. Easy to sew, fun to use! 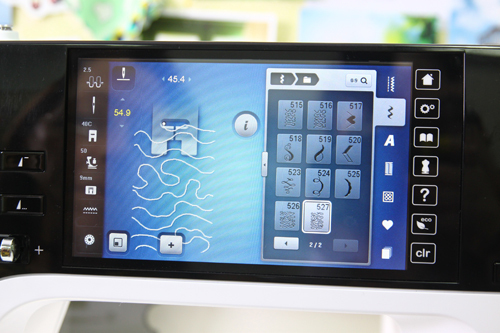 Large sideways-motion stitches from the BERNINA 780 E are featured, but the towels can also be made using other decorative stitches, or by substituting prints for the stitch-embellished fabrics. Fabrics used in the model are “Modernology” and “Pure Elements,” designed by Pat Bravo for Art Gallery Fabrics. Cotton thread from the Pat Bravo collection for Aurifil. Step 1) Prepare the fabric pieces. Step 2) Prepare the heart applique pieces. 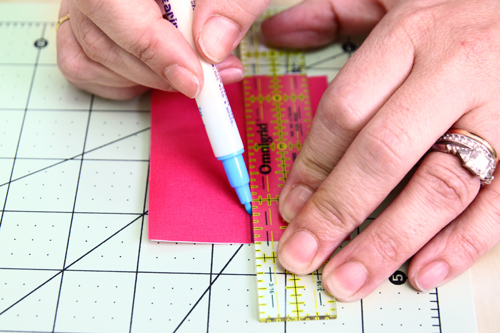 Trace them onto the stabilizer side of the paper-backed stabilizer. Adhere the “heart” stabilizer pieces to the wrong sides of their corresponding fabric rectangles. 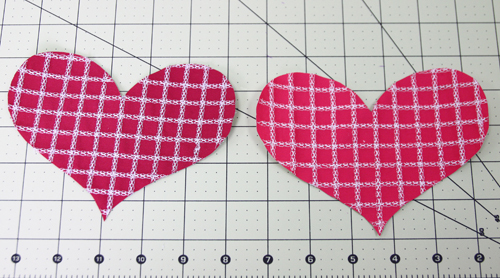 Tip: Create different looks (such as diagonal stripes or plaids) by rotating the hearts before tracing them. 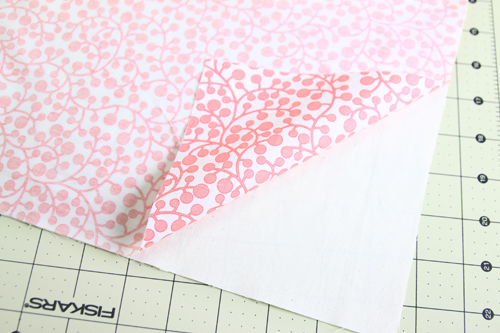 Tip: Paper-backed adhesive stabilizer is great for machine embroidery. Without stabilizer, the fabric tends to pull and pucker when stitched. The adhesive stabilizer holds the fabric in place, securing it so the thread doesn’t pull on it. 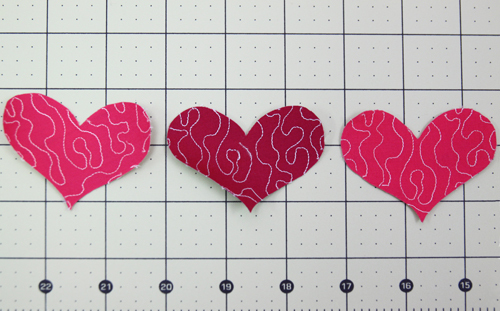 Draw a line through the center of one of the small heart pieces, dividing the sewing field in half lengthwise. This will be your stitching guide. Select a decorative sideways motion stitch. I chose stippling stitch #527 on my BERNINA 780 E, adjusted to 45.5 mm wide and 54.9 mm long. 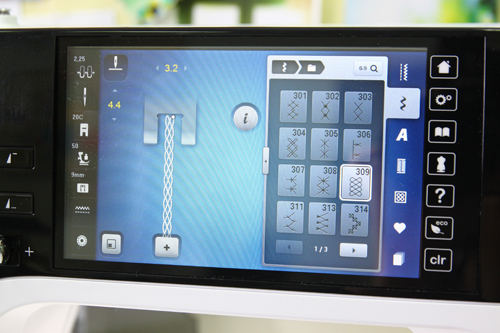 Tip: If your machine doesn’t have sideways motions stitches, use free-motion stippling or rows of decorative stitches. Align the center of the presser foot with the drawn line. Stitch, using the line as a reference guide to keep the fabric straight. Cut out the small heart along the marked lines on the stabilizer. Repeat for the remaining small hearts. Draw a line 1/4ʺ away and parallel to an edge of one of the medium heart pieces. Draw a second line 3/4ʺ from the first line. Repeat, filling the rectangle with lines spaced 3/4ʺ apart. Select a decorative stitch. I chose one with small, medium, and large circles, stitch #431 on my BERNINA 780 E, with a width of 5.5 mm and length of 27.3 mm. Tip: Different stitches use different feet. 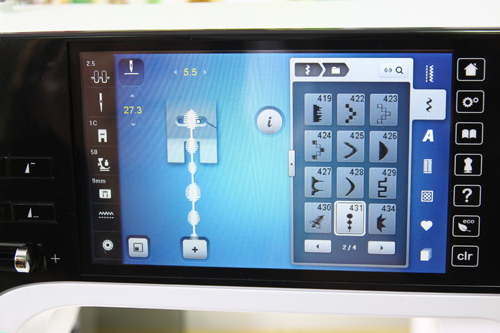 The BERNINA 780 E screen tells you exactly which foot to use. A no-brainer! Align the center of the presser foot with a drawn line. Stitch, using the lines as guides. Cut out the medium heart along the marked lines on the stabilizer. Repeat for the remaining medium hearts. 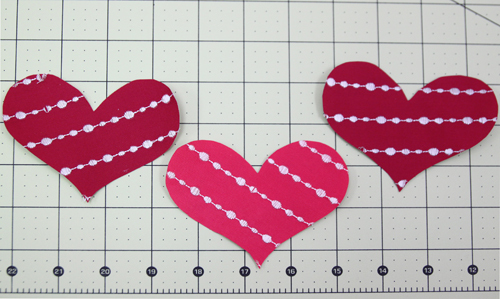 Draw parallel lines 1/2ʺ apart on one of the large heart pieces. Draw a second set of lines perpendicular to the first, also 1/2ʺ apart, to create a grid. Select a decorative stitch. 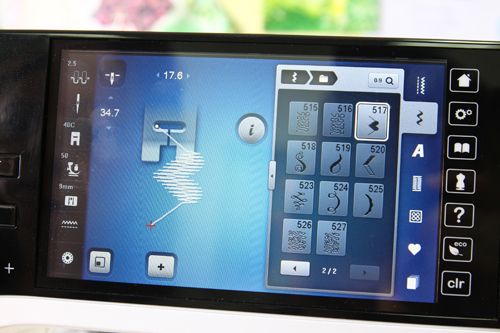 I chose a decorative cross stitch, #431 on my BERNINA 780 E, with a width of 3.2 mm and length of 4.4 mm. Stitch all the lines in one direction, using the lines as guides. Repeat, stitching the perpendicular lines. Cut out the large heart along the marked lines on the stabilizer. Repeat for the remaining large heart. Step 3) Applique the hearts. 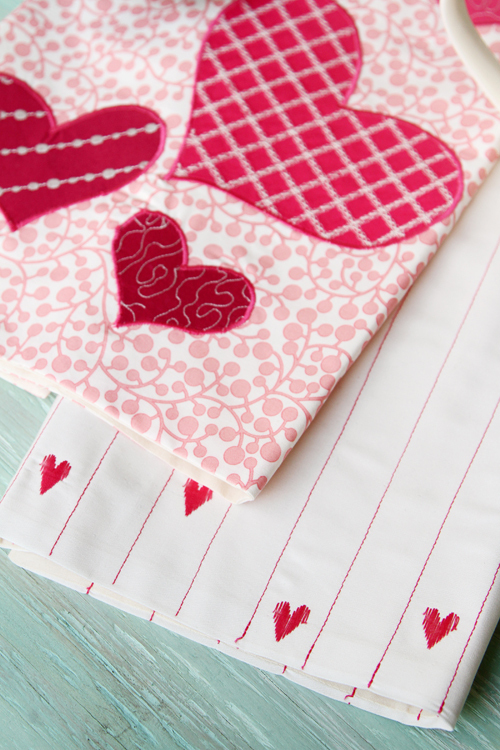 Play with different arrangements of your stitched hearts on the main fabric rectangle. 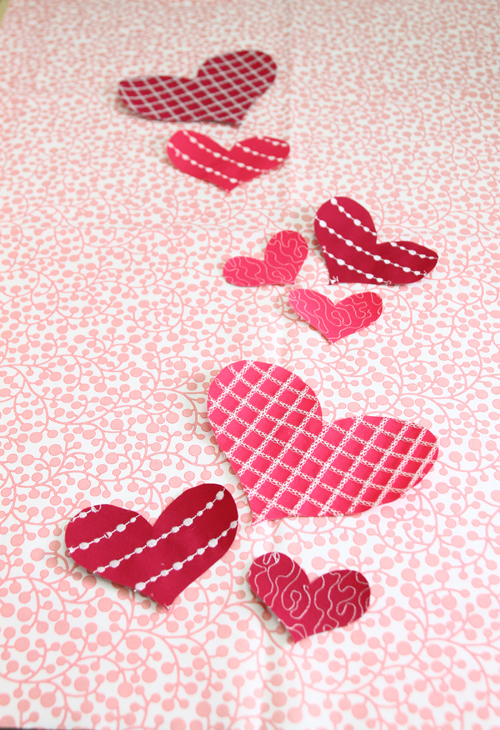 Keep in mind the display of the hearts on your kitchen towel when it is folded over the oven or cabinet door handles. For my arrangement I used the length of the fabric, marked a line through the center (11ʺ from the edge), and marked lines 4-1/2ʺ from it on each side, creating a 9ʺ center area. Once you’ve arranged the hearts to your liking, pin them in place. Flip the main fabric over and adhere the 11ʺ x 29ʺ piece of stabilizer to it, making sure it is centered on the fabric. Note: If you change the placement of the hearts, make sure you cut a wide enough piece of stabilizer to cover all of them. 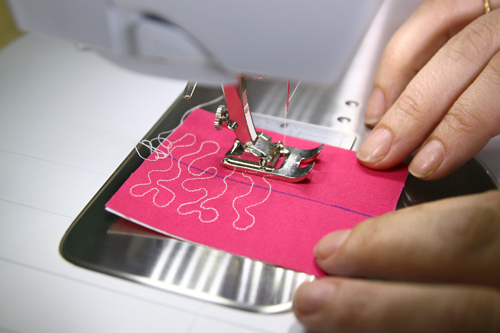 Select a zigzag stitch and adjust the width to 3.0 mm and the length to satin stitch (around 0.40 mm). Attach the open-toe foot to the sewing machine. Engage Needle Stop Down if your machine has this function. 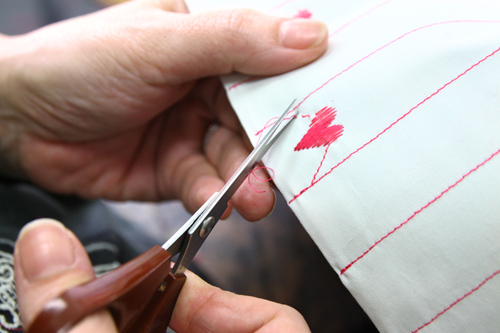 Begin stitching along a straight part of each heart, using the marked groove (or inside edge) as your stitching guide. 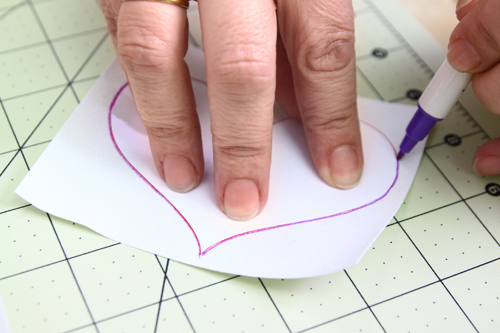 Stitch slowly and follow the contour of the heart shape. 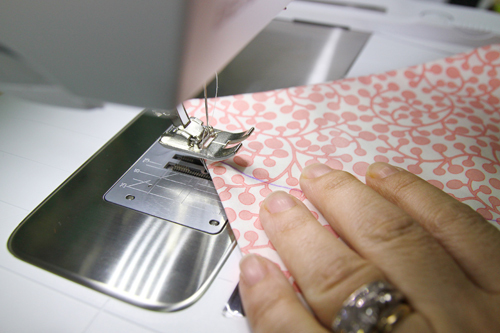 With the needle down, raise the presser foot to maneuver curves, pivoting the fabric around the needle slightly. 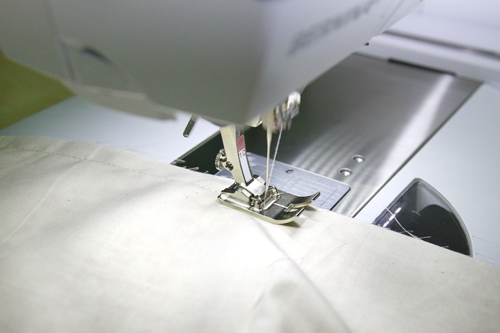 Tip: The BERNINA Free Hand System is a lever for raising and lowering the presser foot with your knee. No hands! When all the hearts have been appliquéd in place, gently tear away the excess stabilizer from the back, being careful not to rip the stitches. Clip thread tails. Press. 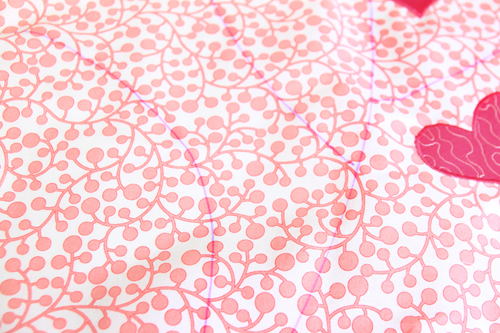 When appliquéing round shapes, you will always encounter many curves. Here are a few rules to follow to keep your stitches perfect. 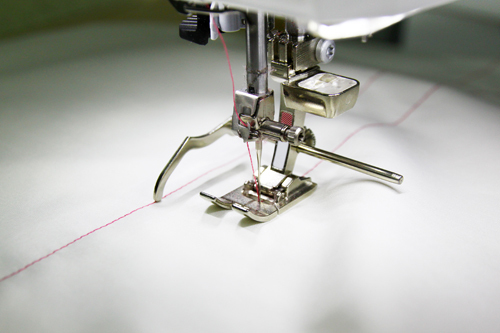 Be sure to keep your needle stop position down to ensure continuity of the stitching line. I love satin stitch—a very short zigzag—for appliqué. 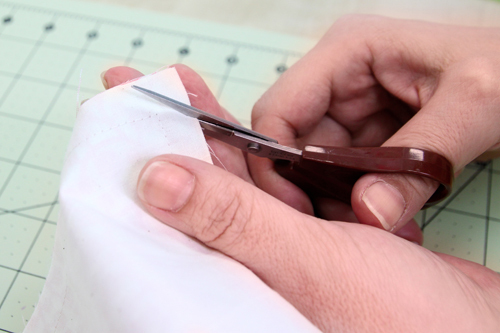 The stitch length should be short enough to cover the raw edge of the fabric. For a concave shape, the pivot point will be on the inner side of the stitching. For a convex shape, the pivot point will be on the outer side of the stitching. For small shapes, you may need to decrease the stitch width. The smaller the shape, the more difficult it becomes to maneuver the stitches on curves. When ironing appliquéd pieces, press from the wrong side to avoid flattening the stitches. Step 4) Construct the towel. 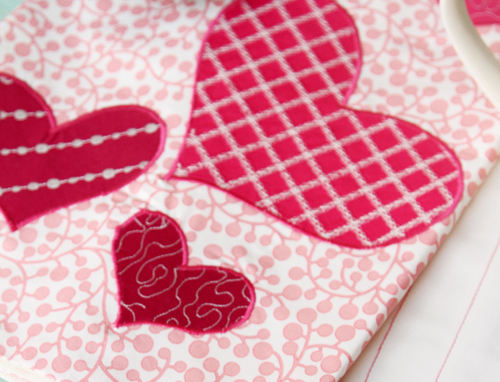 Place a 22ʺ x 29ʺ piece of muslin right sides together with your heart-appliquéd top. 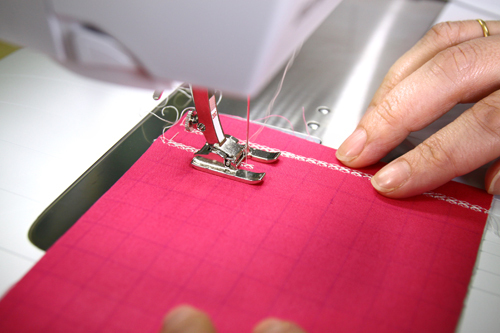 Select a straight stitch with a length of 3.0 mm. Using a 1/2ʺ-wide seam allowance, sew around the edges of the towel, pivoting at the corners and leaving a 2ʺ opening for turning. When done stitching, clip the corners, making sure not to cut through the stitching. Turn the towel right side and push out the corners with a turning tool or large knitting needle. Press and hand-stitch the opening closed. Step 5) Quilt the towel. The last step is to quilt the layers together. 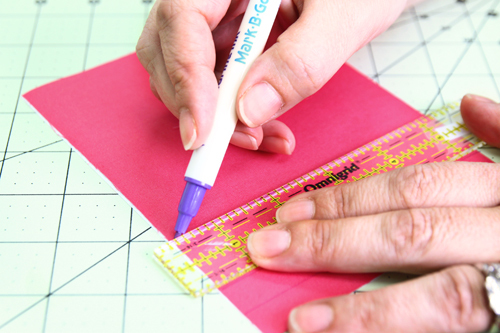 Using a disappearing marker, draw a design for quilting on the front of your towel. 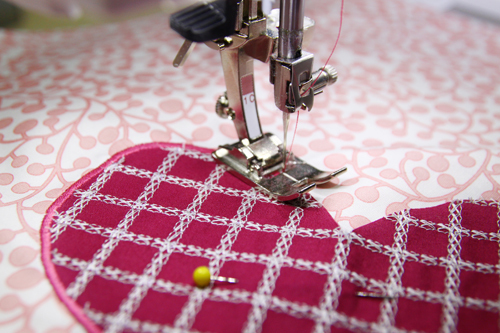 Tip: To keep layers from shifting during quilting, use a walking foot (BERNINA Walking Foot #50), or engage Dual Feed if your machine has that capability. 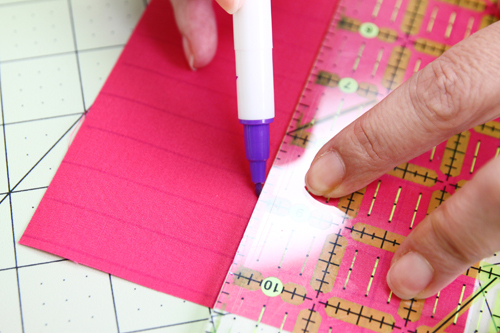 Select a straight stitch (or a stitch of your choice) and sew along the marked lines. When finished, press your towel. Step 6) Make the second towel. For the second towel, place the solid #1 rectangle and remaining muslin piece right sides together. 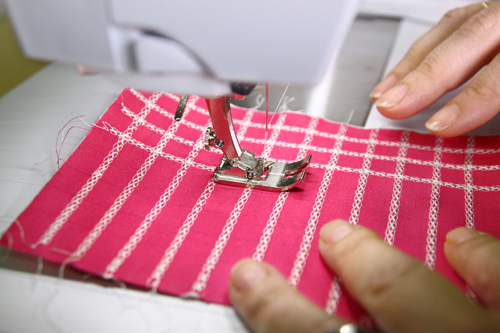 Using a 1/2ʺ-wide seam allowance, start sewing at the bottom of the towel, leaving a 2ʺ opening for turning. Clip the corners, turn right side out, push out the corners, press, and stitch the opening closed. Fold the towel in half lengthwise; press to make a crease. 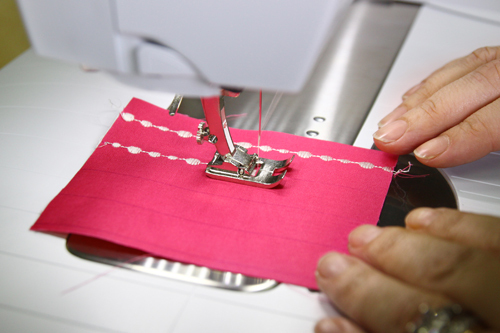 Change to a contrasting thread that works well with your solid fabric choice. Stitch along the crease you just made. Attach the seam guide to the presser foot and adjust it to 1ʺ from the center of the foot. 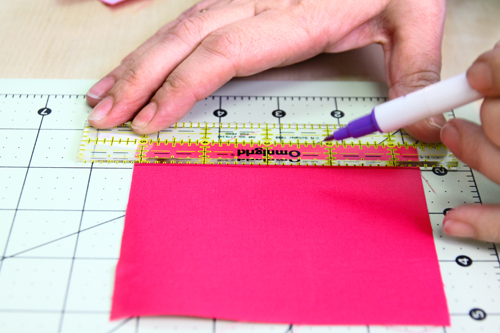 Stitch a second line, aligning the guide with the first stitching to space the lines 1ʺ apart. Continue stitching lines until the entire towel is quilted. Select a sideways-motion heart stitch. I chose stitch #517 on the BERNINA 780 E, adjusted to 17.6 mm wide and 34.7 mm long. 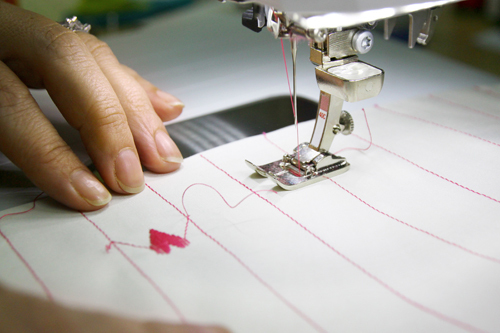 Tip: If your machine doesn’t have a large heart stitch, use smaller hearts or substitute another type of embellishment, such as rubber-stamped red hearts. With the solid #1 side face up, place a 2-1/2ʺ x 29ʺ strip of stabilizer under the end of the towel. Stitch hearts between the lines, beginning just outside the vertical lines to have the heart centered between them. Repeat to add additional hearts; play with the placement and just have fun. Clean up the hearts by removing the side stitches and leaving just the hearts. Remove the stabilizer from the back of the towel; press. Visit Pat Bravo at www.patbravo.com and at her Soulful Eyes blog. Previous Previous post: Car Repair with CutWork! Hi, I just have a question about your Bernina. I also have a 780 but it doesn’t have the E. What does the E on yours stand for? Just curious! Thanks. PS. I’m gonna make these towels for my sister who will be coming down to Fort Myers to spend the rest of the winter with me. I think I know now what the E stands for . Is it “embroidery”? My 780 is also embroidery but there’s no E after the number. The 780 is the machine number. 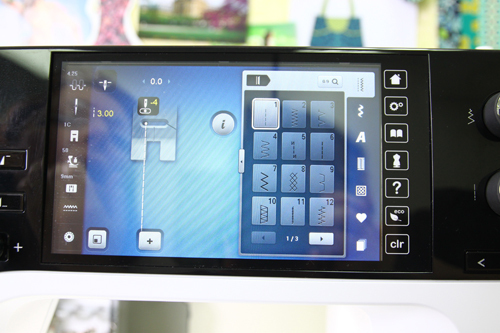 The E refers to the embroidery that comes with some machines. 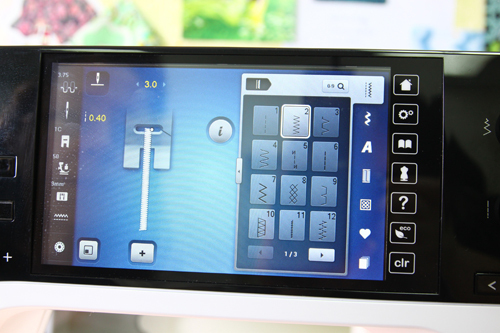 A 780E comes with an embroidery unit. A 770 machine has embroidery optionally so it does not have an E at the end. The machine itself only carries the machine number in both cases. Please, where can I find the fabrics “Modernology” and “Pure Elements,” designed by Pat Bravo for Art Gallery Fabrics. I have followed all the links but can’t find any way to purchase. Thanks.